The University of Chicago’s Logan Center Exhibitions presents a rare solo exhibition of the Chinese film-based artist Yang Fudong (杨福东), one of the preeminent Chinese artists of the generation that rose to international prominence since the 1990s. Developed in conjunction with UChicago Arts' Envisioning China: A Festival of Arts and Culture, the exhibition is named after the poignant, multi-channel meditation on the artist's place of birth, East of Que Village (2007), and is the first exhibition of Fudong’s work in Chicago in a decade. Presented on six screens distributed throughout the Logan Center main gallery space, East of Que Village is an objective if fractured depiction of an isolated village in rural Hebei, populated mostly by wild dogs—a contrast to the images of beautiful and urbane Chinese youth that have come to define Fudong's films. While these characters still appear in the exhibition, in rarely-seen single-channel works, the overall presentation foregrounds the range and complexity of the artist's vision of contemporary Chinese culture. Yang Fudong’s East of Que Village is both film and installation. Its panoramic setup rejects linear storytelling, as it is impossible for the viewer to internalize all six videos at once. 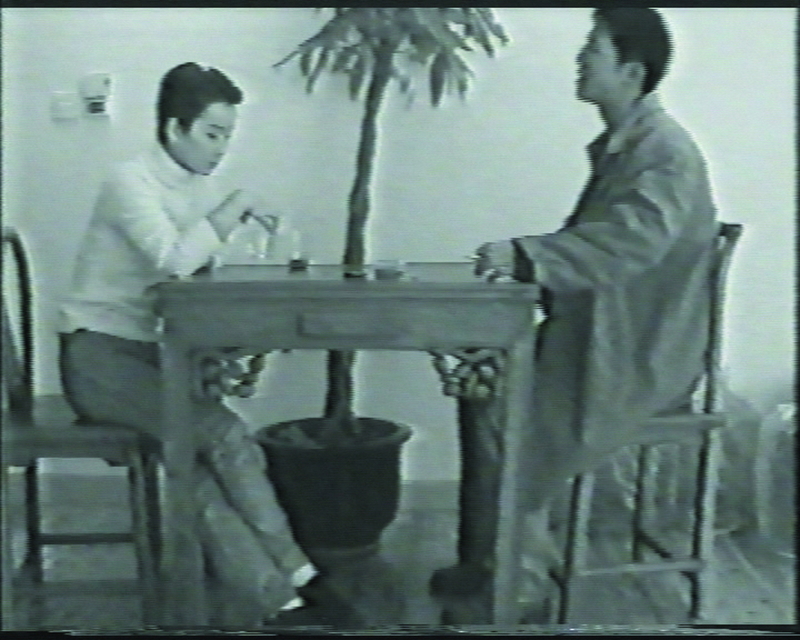 While East of Que Village, unlike Yang’s other films such as Seven Intellectuals in a Bamboo Forest (2003), depicts an atmosphere of rural desolation, it is equally connected to the artist’s biography. It takes place in Yang’s hometown, an isolated village in rural Hebei. We see few people and hear a funerary procession. 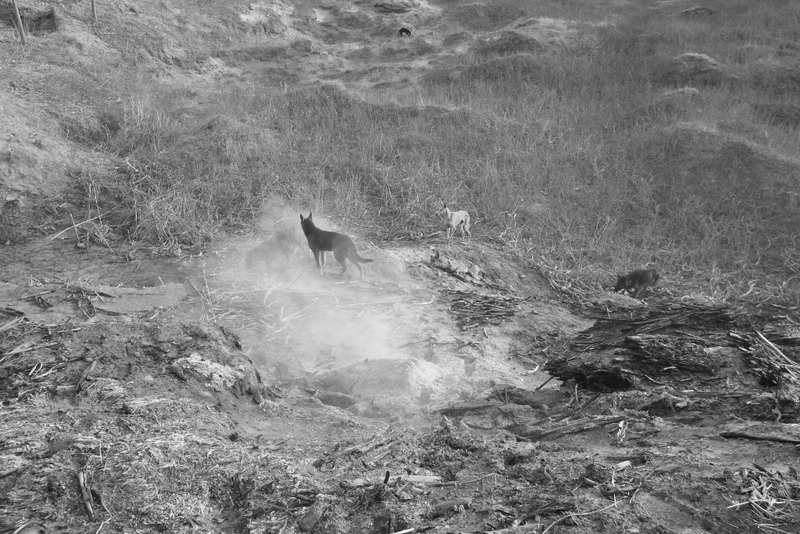 The focus of the film, however, is a pack of wild, starving dogs, attempting to survive in this desolate expanse. The film’s atmosphere is one of utter bleakness, mediated by an objective, journalistic style. In contrast to the evolving metropolitan culture depicted in Yang’s best-known films, here we encounter a parallel Chinese reality that continues to exist. The other films in the exhibition, all single-channel videos, span over twenty years of Yang’s career. 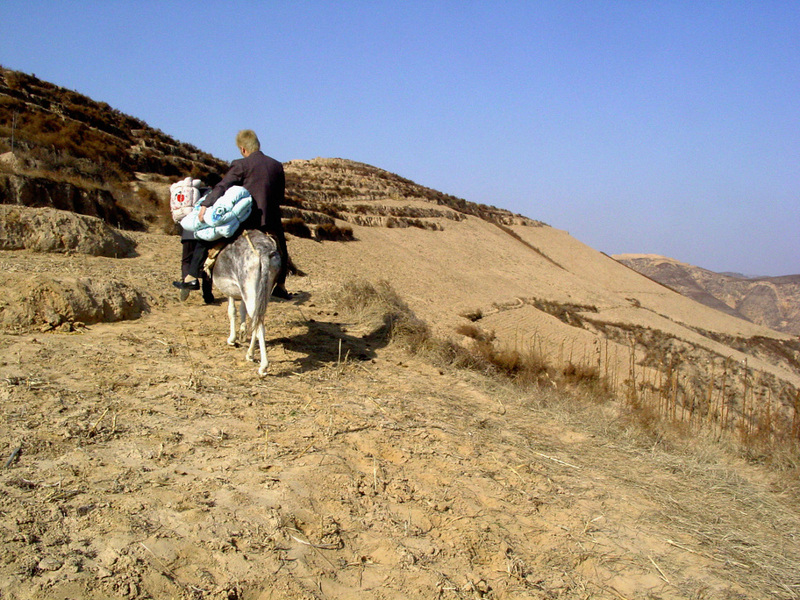 Like East of Que Village, Yang’s seven-minute, single-channel video The Half Hitching Post (2005) illustrates the growing gap between rural and urban China. Two young men are moving to an isolated village on the Loess Plateau in northern China while a young couple simultaneously attempts to leave it. The human-driven narrative, the landscape recalling classical Chinese scroll paintings, and the costumes – where the business suit and peasant skirt meet incongruously – exemplify the artist’s sophisticated mixing of genres. After All I Didn’t Force You (1998), Yang’s earliest and most free-form film in the exhibition, is an atmospheric montage centered on a boy and girl in a city. As the tribal punk percussion of the sound track suddenly gives way to the tropical rhythms of Bossa Nova, we see the role of Fudong’s eclectic ear in forging his atmospheric image of alienated youth. Yang’s first foray into the noir genre, the whimsical single-channel video City Light (2000), also takes us out of the countryside. In the urban environment, identity is un-fixed as a young man and his doppelganger rehearse detective choreographies. In step with Yang’s spatio-temporal investigations, the exhibition moves outside the gallery with the presentation of the short video Siemens “S10” (2003), created in collaboration with Siemens Business Communication Systems Ltd. in Shanghai. Here, twenty of the company’s employees are mobilized as actors clad in identical uniforms, which connect the cast through intricate zippers, forging a type of social sculpture. Yang’s reflection on his own generation, part of an emerging Chinese middle class, here links to a portrait of global corporate culture, reimagined with absurdist delight. The exhibition is co-curated by Monika Szewczyk, Visual Arts Program Curator at the Logan Center, and Wu Hung, the Harrie A. Vanderstappen Distinguished Service Professor of Art History and Consulting Curator at the Smart Museum. Yang Fudong (b. 1971, Beijing) is one of China’s most accomplished contemporary artists. Self-taught in photography and video, his works are informed by a wide range of influences from the French New Wave and Chinese scroll paintings. Although initially trained as a painter, graduating from the Art Academy of Hangzhou (now China Academy of Art) in 1995, Yang began participating in an avant-garde discourse in the 1990s, during which he took a three-month vow of silence. He has exhibited internationally in both group and solo exhibitions since 2001. An early solo exhibition at the Renaissance Society in Chicago (2004) featured the second of his five-part work Seven Intellectuals in a Bamboo Forest as well as important early films. Other solo exhibitions include Kunsthalle Wien, Vienna (2005), the Asia Society, New York (2009), the National Museum of Contemporary Art, Athens (2010), Parasol Unit, London (2011), and most recently, Estranged Paradise (2013), a show spanning his entire career presented at the Kunsthalle Zurich and the Berkeley Art Museum/ Pacific Film Archive. He has participated in group exhibitions including Documenta XI in Kassel (2002) and numerous international biennials: Shanghai (2000, 2002), Istanbul and Yokahama (2001), Venice (2003 and 2007) and the Carnegie International in Pittsburgh (2005), the Asia Pacific Triennial (2006) Sydney (2010), Kiev (2012), and Sharjah (2013). Yang lives and works in Shanghai, and teaches at the China Academy of Art. UChicago Arts presents a diverse selection of art, film, music, conversations and performances connected to the arts and cultural history of China during a five-month festival. From the magnificent art and spectacle of Chinese opera to rarely screened silent films and world premiere performances, the festival opens a window on the rich cultural heritage of China, past and present. Envisioning China is directed by Leigh Fagin, Assistant Director of Collaborative Programming at the Reva and David Logan Center for the Arts. Professor Judith Zeitlin is the faculty director of the festival. Visit the festival website for the latest announcements and like the festival on Facebook. A substantial brochure with a curators’ introduction and an interview between Yang Fudong and Professor Wu Hung will be published on the occasion of the exhibition (English and Chinese).